Description: The monument is a granite slab commemorating the division that manned the first line of defense for the Confederates during the Battle of Averasboro. The slab is rectangular with a shallow point at the top, giving it a tombstone-like appearance. Location: The marker is located near Dunn, in Cumberland County. It sits on Burnett Road (North Carolina Route 82), just south of the Harnett County line. 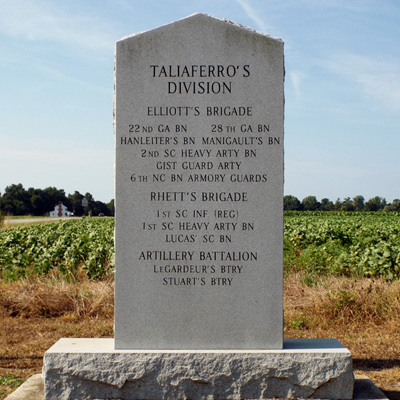 Landscape: The monument is located at the site of the first line of the Confederate defense and is within walking distance of a number of other markers.